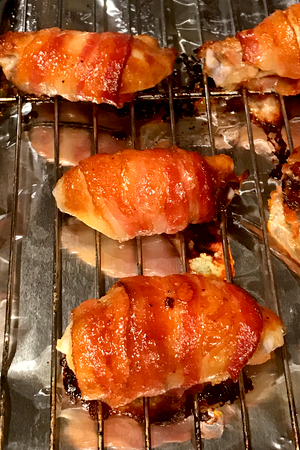 We just took chicken wings to a new level with this Maple Bacon Wrapped Chicken Wings recipe. We have been a fan of chicken wings for years. From basic buffalo chicken wings to wings that have been smoked for hours, we love them all. Barbecue Bacon Wrapped Chicken Wings ready for the party. We have shared some of our favorite chicken wing recipes over the past several years. In fact, our most searched recipe every weekend is our How To Smoke Chicken Wings. It is so easy to make smoked chicken wings, however, in order to do so, a smoker is required. So if you don’t have your own smoker, no worries. 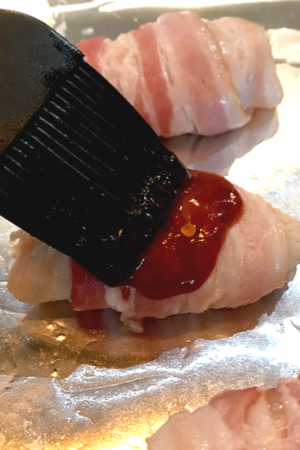 Place the wing on top of the bacon and then wrap it around. We also have recipes for wings that are made in the slow cooker, instant pot, and of course, in the oven. 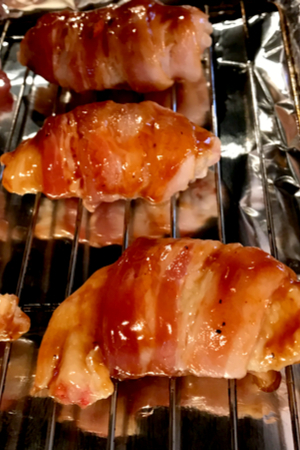 But our newest favorite, and I am sure one that will be a favorite for many wing fanatics, is our Maple Bacon Wrapped Chicken Wings recipe. 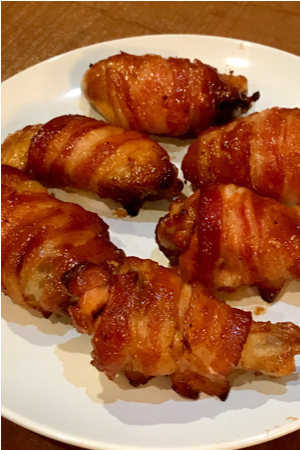 So how did we come up with the idea to wrap the chicken wings in bacon? No, it wasn’t because of the old saying….Everything Is Better With Bacon. Although, we couldn’t agree more! The idea arose from a trip we took to Texas. We went to a few different restaurants and on the menu of each was an appetizer that caught our eye. Maple syrup and barbecue sauce make the perfect glaze. You guessed it…Bacon Wrapped Chicken Wings. 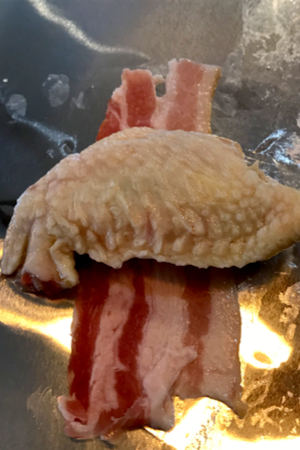 After all of these years of making chicken wings I never thought of wrapping them in bacon. They were so good as is, that I didn’t think that they could get any better. Depending on the size of the wings, use a full or half piece of bacon. To make things even better, I decided to add a maple glaze on top of the bacon wrapped chicken wings. During breakfast, I always love when my bacon slides into the maple syrup that has been drizzled over my pancakes. So I thought to myself, why not drizzle some maple syrup over the bacon in this recipe? The maple glaze added a nice sweetness to the wings, but something was missing. The bacon wrapped chicken wings needed a little of that ‘classic wing flavor’. Use a pastry brush to apply the glaze to the wings. Buffalo sauce wouldn’t work with this combination. So I decided to add a little barbecue sauce to the glaze. The wings had just the right amount of sweetness that was complimented perfectly with the smokey flavor of the barbecue sauce. Wings, bacon, maple syrup and barbecue sauce…..the winning combination!!! In order for the wings to turn out perfect, there are a few tips to follow. Place the wings on a baking rack with the seam side down. In order for the bacon to wrap around the wing perfectly, you must take in consideration the size of the wing. Store-bought wings come in all different sizes. If you have smaller wings, then a half piece of bacon will do. However, if your wings are large, or if you have a lot of drums in the mixture, a full piece of bacon may be necessary. The key is to have the ends of the bacon on the underside of the wings during the baking process. So some trimming of the bacon may be necessary. The best way to bake wings is to use a baking rack. This is the metal rack that fits down and inside a rimmed baking sheet. Not only does this allow the air to circulate around the entire wing during the cooking process, it also helps to seal the bacon shut. Bacon wrapped chicken wings cooked and ready to be eaten. To make clean up a breeze, be sure to wrap the baking sheet in foil and spray the baking rack with non-stick spray. 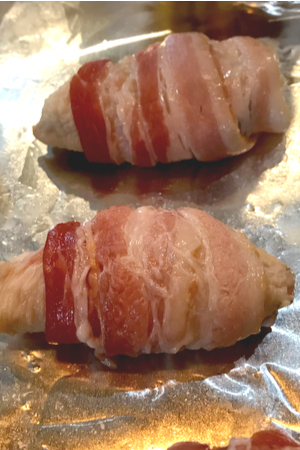 I prefer to turn the bacon wrapped chicken wings after an initial 30 minutes of cook time. Although the baking rack does a nice job of cooking the underside of the wings, it just doesn’t get as brown as the tops. By turning them over, the bacon has time to crisp and come out perfect on all sides. And that is all there is to this delicious appetizer! Now that you have our newest wing recipe, I am sure that it will become one of your favorites. To receive our 3 Home, Garden, Recipe and Simple Life articles each week, sign up below for our free email list. This article may contain affiliate links. Baked bacon wrapped chicken wings with a maple and brown sugar glaze that will become the hit of every party! Line a large baking sheet with aluminum foil and spray a baking sheet with nonstick spray. Place the baking rack on the baking sheet. Wrap each wing with bacon. *Depending on the size of the wing a ½ piece of bacon may only be needed. Cut the bacon so that the ends are on the underside of the wing when wrapped. Place on prepared baking rack. 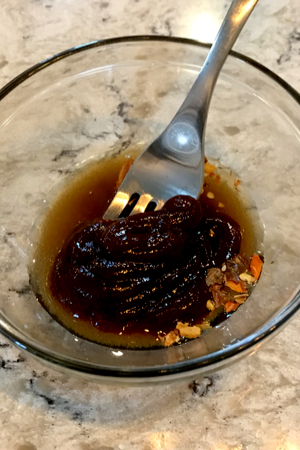 In a small bowl, combine barbecue sauce, maple syrup, brown sugar, and crushed red pepper flakes. Whisk to combine. Brush the sauce all over the wings and bake for 30 minutes. Turn the wings over and bake for an additional 15 minutes or until wings and bacon are crisp and golden. ← Growing Tomatoes – 5 Simple Secrets To A Great Crop!